Fiorentino Offshore Anchor w/ Para-Ring at AhoyCaptain.com - Always your best source. Whether you're a novice or an offshore expert, here's a great place to start. See the full Fiorentino Rigging System at work. 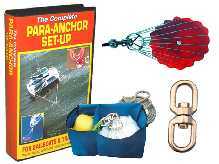 To learn why thousands of people never leave home without their boat's life preserver see Why a Para-Anchor? Click here for Common Questions. The Fiorentino Para-Anchor's patented design makes it easy for any crew member to deploy safely every time. Simply drop the rolled up unit into the water. Secure your anchor line, your done! The Fiorentino's Para-Ring and precision weight placement quickly sink the para-anchor below dangerous waves. The fast submersion fully inflates the parachute canopy immediately. Engineered by offshore safety experts, it's the only parachute anchor to self adjust in heavy seas and strong ocean currents. Fiorentino Offshore Anchor with Para-Ring is the first and only lightweight parachute sea anchor that absorbs massive shock loads without blowing panels or twisting parachute lines. That means no collapsing canopies, which can make quite a difference when sailing in storm conditions! Fiorentino's exclusive Offshore Para-Anchor is built with more panels and heavier shroud lines than the Coastal Para-Anchor. The higher number of panels better disperse the increased stresses that larger, offshore, heavy-displacement vessels are more likely to encounter. The Fiorentino's Offshore Para-Anchor includes the world's first Anchor Stabilizer "the Para-Ring". The self-adjusting Para-Ring prevents the elements from pushing, rolling, or spinning a parachute anchor out of control, which can lead to a tangled parachute or blown out canopy panel. Para-anchor balance is achieved as the Para-Ring self-adjusts to uneven shock loads that are carried down the shroud lines from the canopy. The tilting of the Para-Ring neutralizes the mixed energy to create an even pull on the parachute canopy. Pack away in two minutes or less with Fiorentino's Fast-PAK!. All you do is roll it up like a sleeping bag and place everything in one bag...not two or three! Its intelligent design lets you keep it simple, so you can concentrate on cruising.